This post brought to you by Butterball Every Day. All opinions are 100% mine. I’m not sure why but ever since Princess P started preschool, I’ve been really trying to make an effort to eat better. And I in no way mean a full on diet; I’m just trying to make smarter choices with my meals. Like eating more veggies & switching out some of my favorite ingredients with leaner, more wholesome options that still give me all the flavor! Of course one of the first things I had to find an alternative for was bacon! I’ve tried a few turkey bacons in the past & they just didn’t quite measure up. They didn’t have that same great bacon taste I was looking for. 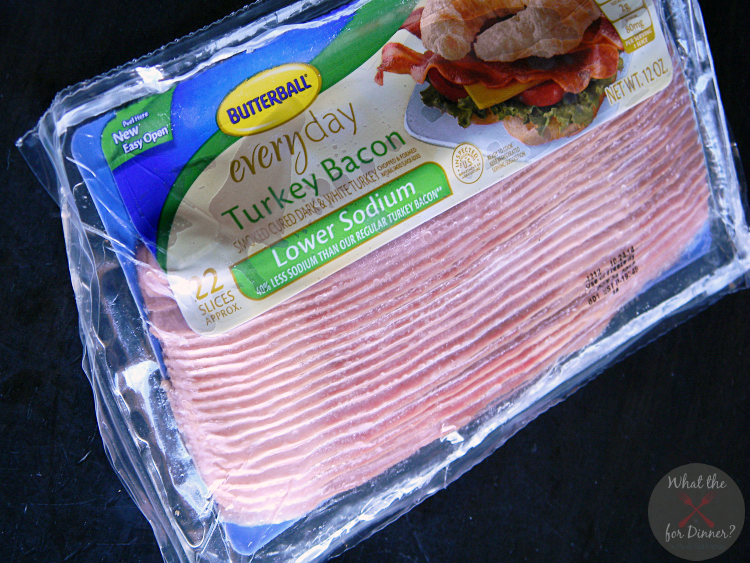 Then I tried Butterball Everyday Turkey Bacon & I have converted! 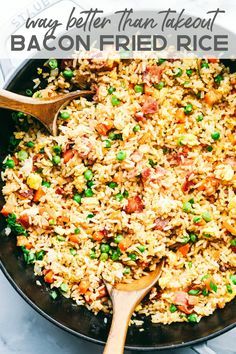 Butterball Turkey Bacon is not only lean but also absolutely delicious & lets me make those better food choices without giving up that great taste I love! 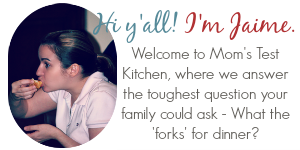 My family & I have can have a great tasting, indulgent meal without the guilt! 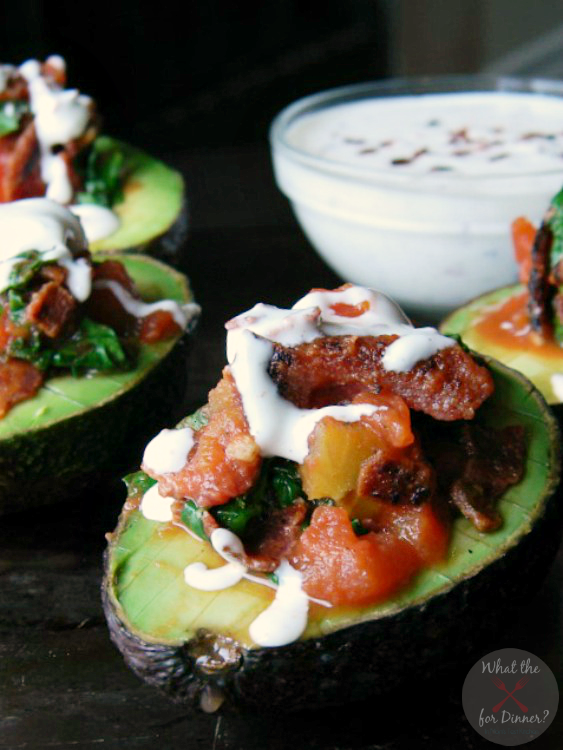 These Smoky BLT Stuffed Avocados served with Bacon Ranch Dressing is one such meal. I made these this past Sunday for lunch while we watched the football games & I can’t begin to explain to y’all how good they were! The smoky flavors in the BLT stuffing mixed with the creamy avocado & then topped with a semi-homemade Bacon Ranch Dressing – made with Turkey Bacon of course! – were so stinking good! 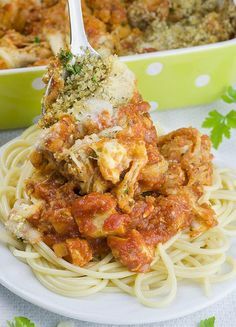 This is definitely a recipe that will make an appearance at our house again! 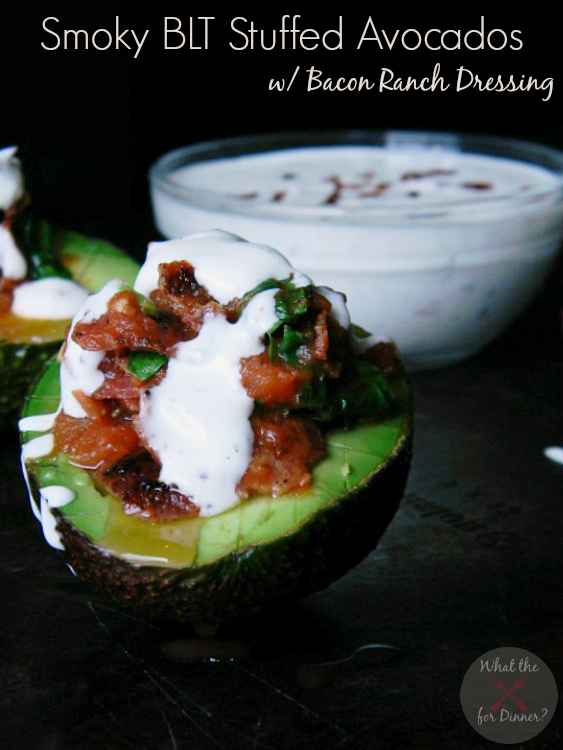 For the Bacon Ranch Dressing, mix the milk, sour cream, mayo & ranch dressing mix in a small bowl. Crumble the bacon into the dressing & stir to mix. Cover & chill until ready to use. 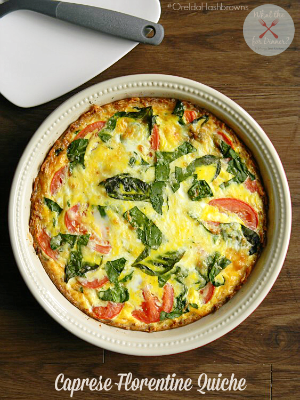 In a large skillet over medium-high heat, add the white cooking white, the tomatoes, liquid smoke, basil, oregano & garlic. Bring to a boil then reduce heat & simmer for about 5 minutes or until the liquid is reduced by at least half to 3/4′s. Once the liquid is reduced, add in the chopped spinach & the crispy, chopped bacon. 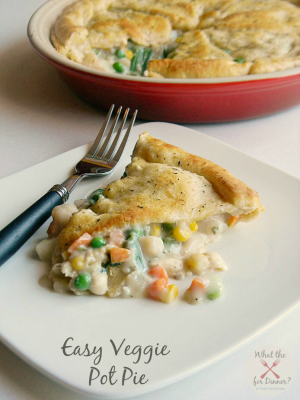 Gently fold to combine the ingredients & allow the spinach to slightly wilt. Remove from heat. While the tomatoes are simmering, halve the avocados & remove the pit. 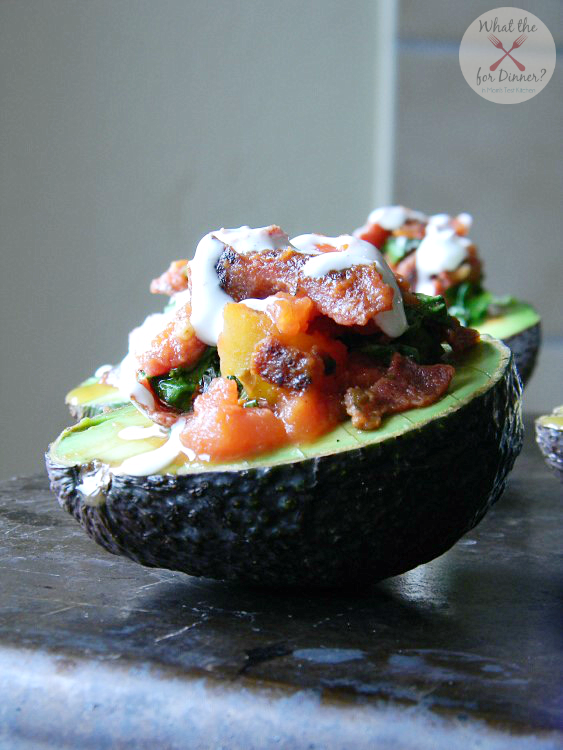 Squeeze the lemon juice lightly over the avocado halves – I scored my avocados as if I was going to use it for guacamole so it would be easier to eat.. Once the Smoky BLT filling is ready, fill each avocado half with 1/4 of the mixture, packing lightly. 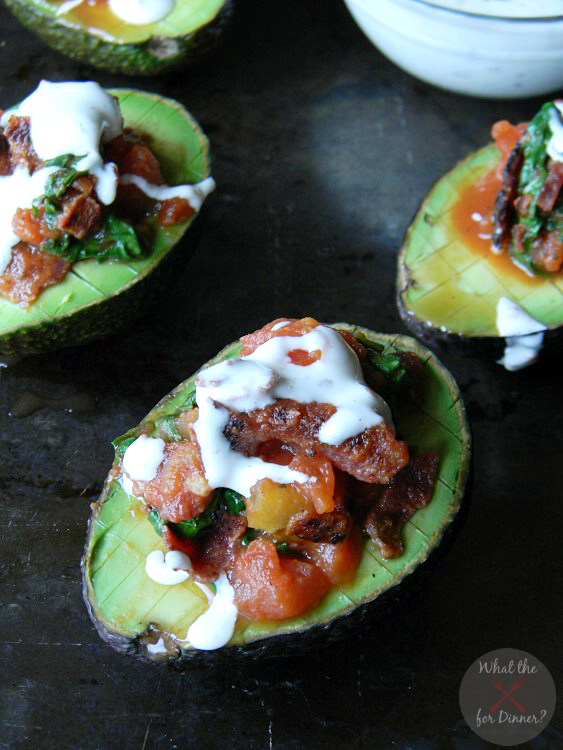 Serve with the Bacon Ranch Dressing lightly drizzled on top of the avocados, on the side or both! 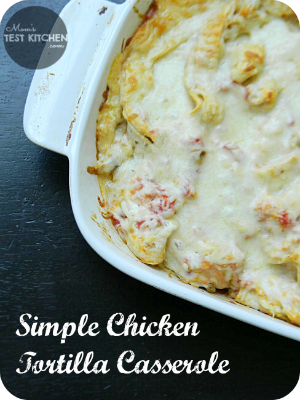 Be sure to explore Butterball for more delicious Butterball recipes & print money saving Butterball coupons! I know that lots of people like regular bacon, but turkey bacon is a great healthy alternative. 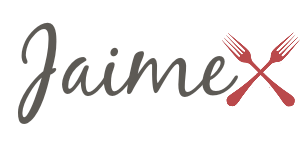 Awesome recipe, Jaime! Thank you Becca! They were so good!! Kimberly recently posted…We Have A Winner In The Halloween Wreath Contest!